The advances & gains reached so far, as well as the on & off the table understandings & commitments in the peace negotiations, despite divergences in positions, difficulties & contradictions, & the crucial outstanding issues that may still be resolved anyway over time with mutual determination and principled negotiations, must be made known widely. My naive view is that the Parties through their negotiators have hitherto by and large demonstrated in varying degrees, and with distinct motivations, their readiness and willingness to discuss & negotiate the substantive agenda, & shown certain flexibility to meet along the way & accept convergences even as they can remain firm yet not obstinate on certain issues or matters. We must read carefully and closely the Joint Statements in Oslo & Rome & find out for ourselves these gains & advances & how fast & close the Parties have gone to endeavor a mutually acceptable & honorable agreement in the short & long term. Then after a studied evaluation, we can appreciate all these and realize there is so much to gain in continuing the momentum rather than squandering what has been reached so far. Also, we must listen intently with an open mind to all other sources of information and insights rather than rely solely on either incomplete, inaccurate or selective information that fit a pre-designed militarist solution or response to the roots of the armed conflict or to the reasons why a significant number of our countrymen continue to bear arms in arduous struggle to bring fundamental changes in society. There is a need not only to keep on talking but also the need to keep on listening. Further, everyone should eventually realize that honoring commitments, fulfilling pledges & respecting solemn & binding bilateral agreements is the most principled gesture of good faith & enduring trust necessary to continue negotiating with sincerity despite differences. Finally & most importantly, identifying, addressing. & resolving the roots of the armed conflict and their manifestations — continuing and vicious stark penury, massive injustice , widespread landlessness, chronic maldevelopment, deprivation of basic human needs & social services, asphyxiating foreign intervention & control, unscrupulous greed for self-serving power, unmitigated exploitation & oppression of the few by the many — are more than compelling reasons to come back to the negotiating table. Resuming the peace talks without the indispensable requisite of safety & immunity guarantees as a matter of fair play for those who stuck out their necks, and without complying with solemn & binding bilateral agreements & commitments will make the resumption of the talks extremely difficult & impracticable, if not impossible, though. [Inquirer.net] Jose Maria Sison, chief political consultant of the National Democratic Front of the Philippines, had a phone conversation with President Duterte on Monday. Duterte has castigated the U.S. for not apologizing for its murder of 1.4 million Filipinos and for continuing the same aggression in various countries. A cease-fire agreement between the Government of the Republic of the Philippines, GRP, under President Rodrigo Duterte and the National Democratic Front of the Philippines, NDFP, led by the Communist Party of the Philippines, CPP, has taken effect on August 26, 2016 since the end of the August 22-26 first round of formal peace talks between the GRP and the NDFP. [PRESS STATEMENT | August 4, 2015] The National Democratic Front of the Philippines (NDFP) Visayas demands the immediate release of NDFP Peace Consultant for Visayas Maria Concepcion “Concha” Araneta-Bocala, including her two companions. She was illegally arrested in Iloilo City by elements of the Intelligence Section of the Armed Forces of the Philippines and PNP Criminal Investigation and Detection Group on August 1. Bocala is under the protection of the Joint Agreement on Safety and Immunity Guarantees (JASIG) as Peace Consultant. She has been issued Document of Identification No. ND978245 under assumed name Remi Estrella. 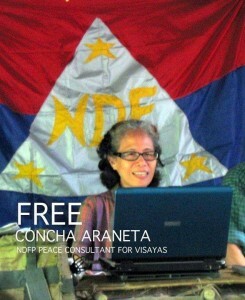 She has been active in the peace talks with the government since Corazon Aquino’s administration. The illegal arrest of NDFP consultants is a clear sabotage of the Peace Process between the Government of the Philippines (GPH) and the NDFP. Also, trumped-up charges filed against NDFP consultants leading to illegal arrest and imprisonment disrupt their vital tasks in the peace talks. The Aquino II Regime must comply with its obligations according to the JASIG and the Comprehensive Agreement of Respect for Human Rights and International Humanitarian Law. Its continued violation and disrespect of such binding peace agreements is proof of its disregard of the GPH-NDFP Peace Process. It is a clear manifestation of its disinterest in just and lasting peace.